Process credit card transactions anywhere you go. Do business anytime, anywhere with ease and security. e Authorize.Net Virtual Terminal is a secure, browser–based interface enabling businesses to authorize, process and manage credit card transactions from any computer that has an Internet connection and a Web browser. Discover how Authorize.Net Virtual Terminal and Credit Card Merchant Services from Veritrans can help your business thrive. 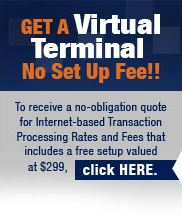 Call 1-866-474-4144 or email info@veritransllc.com today for your FREE consultation.